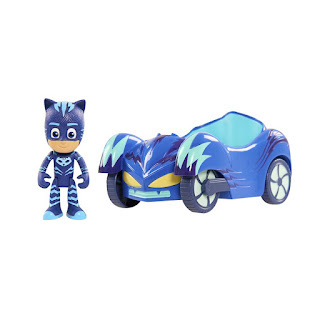 Head over to get this PJ Masks Vehicle Cat Boy Cat Car for ONLY $5.93 (Retail $12.99)! Pounce into action with Cat Boy and his Cat Car! The PJ Masks Cat Boy Figure and Vehicle Assortment comes with a 3" articulated Cat Boy figure and his signature stealthy vehicle, the Cat Car! Roar "into the night to save the day" as you roll the Cat Car with Cat Boy inside! The car can even fit all three PJ Masks 3" Figures! Collect the rest of the Figure and Vehicle Assortments including Owlette and Owl Glider and Gekko and Gekko Mobile for the ultimate PJ Masks experience.